Last week I felt like Angel Food Cake, which is odd since normally I just feel like Adam (yes, I went there :)). Angel food cake is not something I ever crave and that’s probably why I've never made one, well that and I don't have a good tube pan. The one that my mother has is older than I am and looks like it's been in a war. This means that if I wanted to satisfy my sudden desire for angel food cake I would get to buy a new tube pan :). Sounds like a plan to me. My attempts to find the tube pan I wanted (mainly one made by Wilton and on sale) yielded nothing but failure. 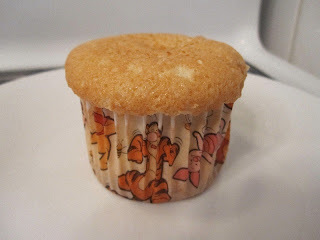 After taking a second look at my Mother's tube pan in desperation, I decided to switch it up and make angel food cupcakes instead (though my Mom swears that her pan works quite well). As I began looking through recipes I quickly realized that angel food cake only has a few differences in process but really no variation in ingredients (the only notable difference being cake vs. all purpose flour). Even when looking at chocolate versions, which up until the last minute I had planned to make, all you do is replace a ¼ cup of flour with a ¼ cup of cocoa powder. I took this as my queue to not muck around with the recipe, other than halving it. The recipe comes together fairly quickly and with little fuss. I went with a version (not intentionally) that brings the egg whites to stiff peaks. Other than making it a bit more difficult to incorporate the flour, there shouldn’t be a difference with the end result. 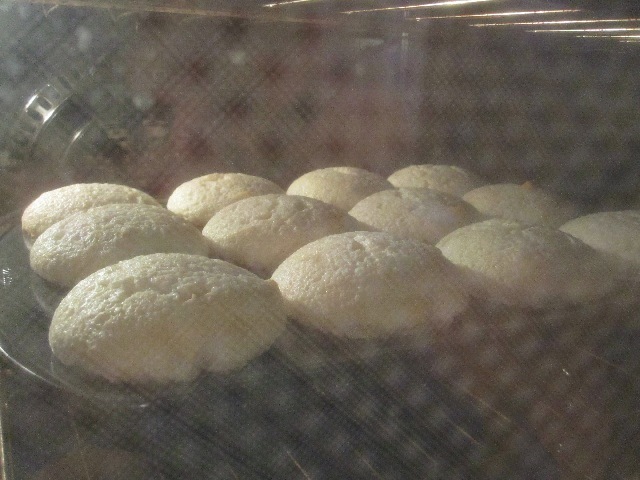 And I have to say, when I looked into the oven I was astonished at how gigantic the cupcakes were. I was then astonished at how much they deflated. This is true of most cakes (at least a little), but especially true of these cupcakes. To help combat this, Angel food cake is normally cooled upside-down (or so I'm told), which is quite impossible with cupcakes (stupid gravity). When these little delights came out of the oven they were light, fluffy and tasted exactly as angel food cake should. If I weren't so lazy they would have been great to pair with some nice vanilla ice cream or fresh berries and whipped cream. Everyone seemed to enjoy them, especially my mother who literally attacked them :), but she's biased, she loves angel food cake. However, my father seemed to take a shine to them as well. At one point on Sunday I walked into the kitchen and saw three cupcakes left. When I walked in again, a few minutes later, there was one remaining and it feared for its life. Since I didn't want to risk having too many cupcakes, I halved the recipe to get a dozen. But with the way these things went I think we could have gone through two or three dozen, easy. And maybe, if we were lucky, there would have been two left to split between my brother and myself :). Adapted from My Kitchen Cafe, Baking Bites and Cookie Madness (and every other angel food cake recipe :)). Preheat oven to 325F and prepare a standard muffin tin with paper liners. In a small bowl sift together flour, half the sugar, and salt. In the medium bowl of a mixer add egg whites and beat until foamy. Add vinegar and beat until soft peaks are formed. Add vanilla and almond extracts and beat to mix. Slowly add second half of sugar, one to two tablespoons at a time, until it's completely mixed. Bring mixture to stiff peaks. Gently and slowly fold the dry ingredients into the egg whites. If it helps you can do it in more than one addition. This step is important because if you go to fast you might deflate the egg whites. Distribute batter evenly into prepared cupcake tin. Once full give it a few shakes to smooth the batter and tap it gently on the counter to remove any air bubbles (as a matter of principle I do this with all cakes). Place on centre rack of the oven for 20-25 minutes until tops are golden brown and cupcakes spring back lightly when touched or when a toothpick comes out clean (this took me 24 minutes). Remove from oven and allow to cool completely in muffin tin on a rack.